In Hindu mythology the Devas are the DemiGods, minor dieties. They reside in heaven. Indra is the King of Devas. Many millions of years ago, Asuras, the Demons, were creating a lot of havoc and making life very difficult for the Gods. Gods were unable to bear the behavior of Asuras any more….So they approach Lord Vishnu for a solution. He decides to help them out. Lord Vishnu suggested that the best way out of this mess is for Gods to secure the ‘nectar of immortality’…This was not going to be an easy task by means. They would have to strive for it. More importantly, He said that they can’t do this on their own…It is a huge task and hence they need to get the help of the Asuras. To get the nectar of immortality they need to put certain herbal medicines into the ocean of milk (this ocean is in heaven). Then they have to use Mount Mandara as a churning stick and serpent Vasuki (king of all serpents) as the rope.With the help of Asuras, Mount Mandara and Vasuki they need to churn the ocean. After a lot of churning, the ocean will generate a pot full of ‘nectar of immortality’. Lord Vishnu then goes on to warn them that they should do the task with utmost devotion and not with the greed of obtaining the final result. He says that at the end of churning if they lose the nectar to Asuras, they should not get angry and annoyed at putting in so much work for nothing. Devas approach Asuras and ask for their help. In return they say that the Asuras can have a share of the nectar. Asuras are tempted, infact they plan to use Devas to churn the milk and once the nectar is generated, they plan to steal everything away from Devas. And so the fun starts - The churning begins…Devas on one side and Asuras on the other. They both are hard at work. Devas perform the task with full concentration - they give it their best without any expectations (just as Lord Vishnu asked them to). Half way through the churning, Mount Mandara starts losing its balance and starts slipping into the ocean. Without the mountain they can’t finish the task at hand. So both Asuras and Devas pray to Lord Vishnu and ask Him to help them out. 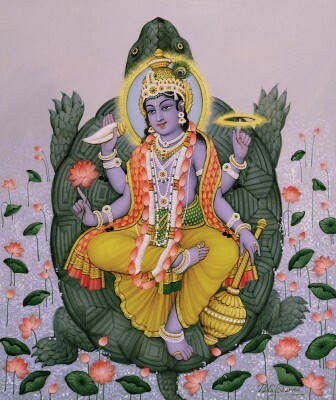 Lord Vishnu incarnates Himself as a turtle. He goes deep into the ocean of the milk and supports the mountain on His back. Devas and Asuras continue churning…And after long days and long nights of work, the churning is complete and a bowl of nectar is generated. Asuras and Devas are equidistant from this bowl of nectar…But Asuras rush in and grab this bowl. Devas, though disappointed, controlled their anger, did not start a fight with Asuras and just accepted the situation as is and walked away. Lord Vishnu was happy with how the Devas conducted themselves. He appears as a beautiful lady and approaches Asuras. Asuras are blinded by the beauty of this lady. They do whatever she asks them to…She asks them to hand over the bowl to her and they do so…As soon as they do it, the lady disappears. God could have easily snatched it from the Asuras rather than appearing as a beautiful lady - The thing here to be noted is that Asuras through their own weakness and loss of focus from the task at hand, lose the bowl of nectar - What happened was their own fault. They could have easily ignored the beauty of the lady and focussed on the task at hand - but they failed to do us and in the process they lost their prized possession. Lord Vishnu gives the bowl of nectar to Devas. This nectar makes Devas immortal. They now have the power and from then on dominated the Asuras. For many, this story might sound a bit far fetched - Many mythical stories do sound a bit unreal - Mythical stories are not there for us to judge whether they sound real or not - They are there for us to draw important lessons from them. Try to understand what they are trying teach you. The important lesson in this story is - When you perform any job or duty just do it without expecting any results. Give it your best. The rest will follow. Devas did this and in the end turned out victorious.